DECLÉOR AROMA CLEANSE Toning shower and bath gel is a bath and shower gel with Seaweed Extract and essential oils, designed to remove impurities and neutralise the effects of hard water, tone and revive the skin and waken the senses. The Essential Oils of Lemon, Lavender and Seaweed extract awakens the skin, whilst the refreshing gel turns into a beautiful gentle and invigorating foam bestowing a real feeling of vitality. This vibrant shower gel will make the perfect pick-me-up, as it effectively uplifts both your skin and your senses. Active Ingredients: Marjoram Essential Oil, Lemon Essential Oil, Rosemary Essential Oil, Lavender Essential Oil, Seaweed Extract. 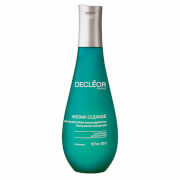 DECLÉOR AROMA CLEANSE Toning shower and bath gel 400ml was found on 3 websites and was price compared using EAN: 3395011003759. The cheapest DECLÉOR AROMA CLEANSE Toning shower and bath gel 400ml is shown as the main item, prices range from £17.85 to £19.50, excluding delivery. Price comparison based on price and delivery charges, with any valid discount codes being applied, is shown in the table above. Prices and information correct at the time of publication.